Crisped to perfection and glazed with the most gorgeous Asian-inspired sauce, this Chili Chana is the most effortlessly delicious appetizer ever!! 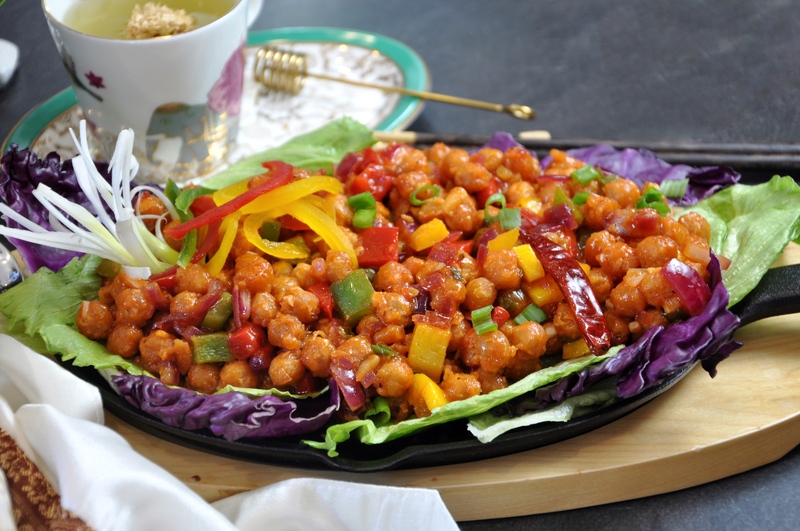 The magic all starts with a super crunchy and firm base of fried chickpeas that are then tossed in a lovely blend of Asian sauces and crisp vegetables. Not over the top spicy, but still packed full of Asian-inspired dynamic flavor, the dish is sure to be a hit with everyone! Perfect for a bold appetizer to start off a dinner party, who can resist an authentic and innovative dish? Let’s face it, the best things in life can still be fried! Open the cans and empty the chickpeas into a strainer. Rinse them with water and let them drain for 1-2 minutes. Spread the chickpeas on a kitchen towel for 5 minutes let all the excess water drain out. However, don’t let them dry out. Empty the chickpeas into a bowl and coat them with corn starch, rice flour, all purpose flour, chili garlic sauce, and a pinch of salt. Now, shallow fry the coated chickpeas until they are golden brown and crispy. Set them aside while the sauce is being made. In a saucepan on medium heat add oil, dried chilies, ginger, and garlic. Sauté them for 1-2 minutes and celery, tomato paste, and spring onions, and sauté for 2 more minutes. Add in the chili sauce, schezwan sauce, ketchup, vinegar, soy sauce, and sweet chili sauce. Cook for roughly 2-4 minutes on medium heat. Gradually add the corn starch into the vegetable stock and make a paste. Then, add this mixture to the saucepan and stir so that no lumps form. Keep stirring until it starts boiling. Your sauce is ready. Mix in the fried chickpeas, onions, peppers, and spring onions. Toss them lightly so that the vegetables remain crisp. Serve hot and enjoy this bold appetizer! You can also soak the chickpeas overnight and pressure cook them, instead of using canned chickpeas. For a party, you can fry the chickpeas and make the sauce a day before. Just bake the chickpeas for 15 minutes at 350F (or air fry) till they are crispy and then toss them with the sauce, peppers and onions before serving.